When it comes to Tucson Appliance Repair, look no further than DR Appliance. We have been serving residents of Tucson, Arizona for several years now and we have been doing well. Apart from appliance repair, we can handle routine checks on your appliances and we never miss any appointments. We can comfortably say we have been able to find our way to the top of Tucson appliance repair because of our policies, guiding principles and qualities. Our core services are refrigerator repair, dryer repair, washer repair, dishwasher repair, AC repair and repair of other appliances. Even though Tucson appliance repair comprises of several service providers, we stand out from others and there are several reasons to hire us and let us handle your appliance repair. There is no profession or trade for which experience does not count and Tucson appliance repair is not an exception either. We can comfortably say we have been operating in Tucson for some years now and we have built a lot of expertise and experience on it. There is virtually no appliance fault that is new to us. Once our team of technicians checks your appliance, it won’t take 20 minutes to diagnose what the problem is. Our experience has given us certain knowledge on the parts of your appliances that are usually replaced more often than others. So we have regular supply of these parts. In other words, the parts are already available, so we don’t tell customers to wait for a few days for us to order certain parts. Having realized that we can’t deliver the best services with old and obsolete tools, we keep upgrading our tools regularly. So, we assure you that we make use of state of the art facilities to repair appliances. We don’t just upgrade our equipment, we also send our team of technicians on regular training on the best way to make use of every new tool and technology. Despite parading the best team of technicians we still do not rest on our oars just to give our customers the very best. We always look out for workshops, seminars, conferences and any other informative gathering on topics relevant to appliance repairs. Whenever there is any new tool or technology relevant to our services, you can be sure that we are already making use of it. To acquire the best knowledge on how to fix every brand of appliance, we send our technicians to get trained by the big manufacturers themselves. In other words, Samsung trains our technician on how to fix Samsung appliances and LG trains us on how to fix LG appliances and it goes on like that. We also have well trained, dedicated and very responsive customer service team that is too eager to receive your calls and attend to your complaints within the shortest possible time. Having operated in Tucson for several years, there is nowhere in Tucson that we can’t reach. Just give us a call and we will be at your doorstep within minutes. Our customers are the reason we have been in business all these years and they are our heartbeat. So we treat them as kings and queens which they really are. Another reason we have no choice but to always keep our customers happy and satisfied by always meeting and exceeding their expectations is because we believe that the cheapest and most effective form of advertisement is reference and positive recommendations from satisfied customers. So we cashed in on it and the result has been amazing. We get references and recommendations regularly. This is why our customer base is increasing geometrically. To prove that we have confidence in our repair services, we usually give our customers certain warranty after every repair work. No matter how small the repair work is, we will give you a warranty period. There is no better way to prove our expertise and confidence in our services. At DR Appliance, we don’t only repair, we also handle installation of new appliances. We can help with the purchase of some of these appliances by advising clients on stores that offer the best deals. Not only that, we also advise customers on how to make the best choice. At DP Appliance, our integrity matters to us so we always keep to our words. We do not cut corners by using cheap and substandard parts to maximize profit because believe that it will eventually backfire. The name and reputation that took us several years to build will be pulled down in a twinkle of an eye. One negative comment can overwrite over 20 positive ones. In Arizona, all trades have to be registered before they can be practiced. 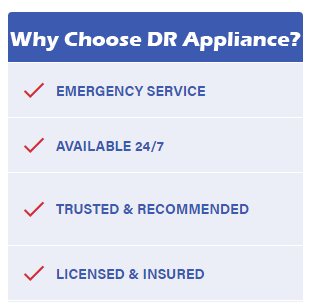 So you can be sure that DR Appliance is duly registered for Tucson appliance repair. We only get to persuade you to hire us once and you will come back on your own subsequently.